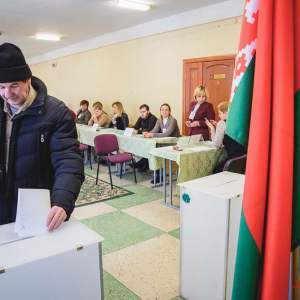 On 18 February 2018, Belarusians elected their representatives to local councils. This campaign presented the authorities with an opportunity to demonstrate their openness and improve performance on their democratisation and human rights record. Instead they used it as a testing ground for their ability to dominate and manipulate domestic politics. This choice sends a strong message about the authorities’ assessment of the strategic environment and oncoming challenges. Given the insignificant role of local councils in the Belarusian political system, local elections rarely stir significant public attention. They are usually perceived as “not a big deal” (albeit with traditionally high, but hardly trustworthy, reported turnout). Accordingly some believed that the authorities would use this relatively insignificant campaign in order to repair their image in respect of liberalization and democratization, which was an important part of the Belarus-West normalization efforts in 2014-2016. Unfortunate developments in 2017 substantially damaged this image, including mass protests over the “anti-parasite decree”, the suppression of those protests, and multiple detainments of independent and opposition activists, politicians and journalists. The actual campaign scenario upset those expectations. The authorities undertook a major effort to safeguard an unrealistically high level of declared turnout. They claimed that some 77% of eligible voters showed up at the polling stations. This clearly contradicted numerous independent reports of low public interest in the elections. Independent and opposition observers and candidates claimed numerous discrepancies between the turnout they observed and the one reported by the electoral commissions. The latter often failed to explain those discrepancies or even did not make any effort to do so. The authorities claimed a massive (over 34%) turnout during early voting. Besides, the observers reported an unusually high level of postal voting. Both are a handy tool for manipulation. The ballots cast early or away from the station cannot be monitored by observers. Accordingly, there are hardly any opportunities to check the authenticity of reported turnout level. For the first time in many years, the observers claimed to detect the use of the infamous technique called carousel voting (multiple voting by designated voters at different polling stations). An observer even managed to take part in it personally (voting three times at different polling stations) and now demands an investigation into this affair from the Ministry of the Interior and the Investigative Committee. The vote count was also kept expectedly non-transparent, according to independent observers. At one polling station, the scandal erupted and led to a recount overseen by the public that showed the opposition candidate taking the vast majority of the votes cast on the main election day. However, he eventually lost the race after the early voting ballots were taken into consideration. Quite logically the non-transparent electoral process resulted in non-transparent outcomes. Only two opposition candidates, both at the lowest village level, were elected alongside over 18,000 new deputies allegedly authorized by the powers that be. Of those elected almost 56% were incumbent deputies and only 2.5% represented political parties (all of them pro-government). One of the two successful independent candidates was Roza Strelchanka, elected in a major village in the Kalinkavičy district of the Homiel region. Soon after her victory, unidentified persons called her using the phone number of the regional administration and threatened to put her into a mental health facility. The other successful candidate re-elected in 2018, Valery Bilibukha from the unregistered Belarusian Christian Democrats, also has a long record of dealing with pressure from the authorities. Alongside the reported poor performance of the opposition, other outcomes merit comment. The Communist Party’s showing proved quite remarkable. The pro-government Communists managed to bring 309 of their rank to the councils at various levels (including taking 10% of seats on the Minsk City council). The advance of Russia-advocates represented another interesting feature. Among those elected, 21 were the citizens of the Russian Federation who have the right to run for the local elections because they have permanent residence in Belarus. 127 of the successful candidates were the members of the Republican Party of Labour and Justice that positions itself as an openly pro-Russian actor (its leader Vasily Zadnepryany recently claimed that his party recognizes Crimea as a legitimate part of Russia). Getting ready for the tough times? The picture outlined poses a question: why was the Belarusian Government willing to go to such lengths for the delivery of such questionable outcomes? One thing can be said confidently: the authorities have dropped the idea of restructuring the country’s political system (even if they ever planned to). This contradicts rumours and debates in 2017 regarding the possible transformation of the constitution and electoral law that would favour the development of political parties. The Liberal Democratic Party of Belarus (LDP) even formally came up with some suggestions, such as the introduction of party list voting. But the outcomes of the local elections clearly show that those suggestions are off the table. Quite illustratively, despite running a rather vigorous campaign, LDP ended up with only five delegates elected. The other thing one can say with confidence is that the authorities made certain decisions on further political developments. Alexander Lukashenka, it seems, will rerun for the presidency when his current term ends and will do so it in the “old school” manner; with heavy reliance on economic incentives, “administrative resources” and similar notorious features. This roll-back to more manipulative and less democratic policies has everything to do with how the authorities assess the existing strategic situation. The forthcoming parliamentary and presidential elections (due to take place no later than in August-September 2020) will most probably run amid persisting economic turmoil, popular unrest, unfriendly Russian media and indifference from the EU and USA. With that in mind, the authorities are preparing to hold those elections the way they perceive as safe. It is therefore quite natural that they reported an unrealistically high level of turnout. Their real potential for mobilizing the constituency and the real level of their electoral support thus remain unclear for the wider public. The problem, however, is that such way of running elections implies excessive reliance on the security services. As the loyalty of those is not warranted, especially in critical situations, their non-transparency is inevitably ambivalent and might affect not only the public but also the authorities themselves. It is interesting to know in this context whether it was the real intention of Lukashenka to let so many Russian and pro-Russian politicians into the local and regional councils; or whether this result actually reflects the “independent” influence of unidentified actors within the establishment. 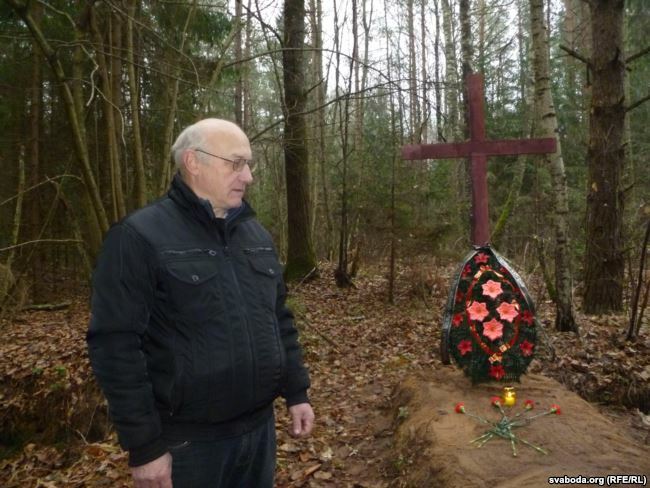 On 6 February 2018, the Viciebsk district court fined Jan Diaržaucau for the unauthorized burial of Stalinist terror victims’ remains in the forest near the village of Hajsy. Even though the initial discovery of human remains at Hajsy dates back to 2014, the authorities have been winding down the official investigation, leaving the bones and skulls on the surface. Jan Diaržaucau and the public initiative “Hajsy – Viciebsk Kurapaty” keep petitioning the local authorities to give the site protected memorial status. Yet three years after the discovery, only the 37 crosses of the ‘people’s memorial’ marked the area of the shooting grounds. As the Belarusian KGB refuses to grant free access to the archives on the Stalinist repressions, it remains unknown where and how many similar burial sites linked to Stalinist terror still exist. 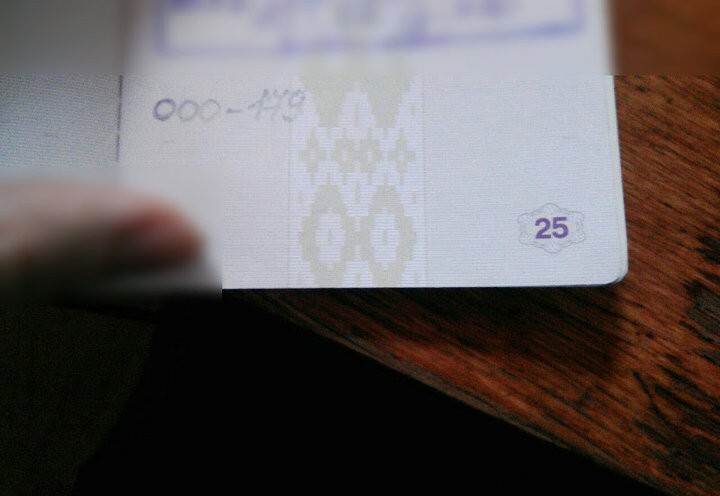 Unlike in neighbouring countries, the modern Belarusian heirs of the NKVD have ensured that all data will remain classified until the late 21st century. Hajsy discoveries: who are the victims? In November 2014, Jan Diaržaucau and his fellow activists from the Conservative Christian Party BPF informed the authorities about large burial grounds near the village of Hajsy, in the vicinity of Viciebsk. The discovery happened after local residents saw pits and scattered human bones in the nearby woods. The appearance of the pits suggested that so-called “black diggers” had recently unearthed the mass graves in search of valuables. Local senior residents still have memories of the 1930s NKVD shootings in these woods. After the civil society activists insisted on a proper investigation, the authorities dispatched the 52nd Search Battalion that discovered remains of at least 172 persons in the autumn of 2015. The Investigative Committee in Viciebsk took some of the remains for examination, yet the experts were unable to determine the exact year of death. The remains were quickly marked as “war victims” and buried as such in common graves. Another burial site was discovered at Hajsy in spring 2017, after grave looters made new excavations in the woods, once again leaving behind human bones, footwear and clothing. Even though all artefacts dated back to 1938 or earlier, the authorities still hesitated to admit that the discovered remains of 245 people belonged to victims of the NKVD mass shootings. Ignored and unburied: why the authorities don’t care about the victims? Jan Dziaržaucau, along with civil society activists, installed the first crosses at Hajsy in the autumn of 2014, marking the creation of a “people’s memorial”. Three and a half years later, they expanded the memorial by adding 34 crosses and new information signs, while the authorities ignored the memorialisation of the killing grounds, in line with its usual policy. 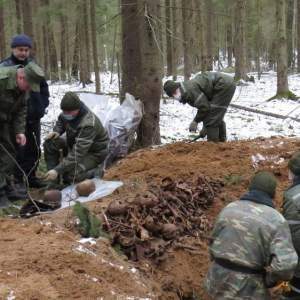 More than that, in February 2018, the authorities tried Diaržaucau for the unauthorized burial of human remains that the 52nd Search Battalion left behind after completing its excavations. Diaržaucau, who since 2015 coordinates the public initiative “Hajsy – Viciebsk Kurapaty” did not deny that he had buried the bones. At the same time, he pointed out to the court that he did not have any other choice due to the inaction of the local authorities in this issue. Although Belarusian laws contain a number of norms on rehabilitation of the Great Terror victims, none concerns the re-burial procedures for the people who were shot by the NKVD. Neither does current legislation contain any regulations on the creation of burial sites for their remains. According to Belarusian advocate Halina Parkhimchyk who represented Jan Dziaržaucau in court proceedings, Belarusian legislation has rules on burying the remnants of those who were killed during the wars but not as a result of political repressions. However, according to her, moral rules dictate that the victims of the Stalinist terror should also be buried with respect. 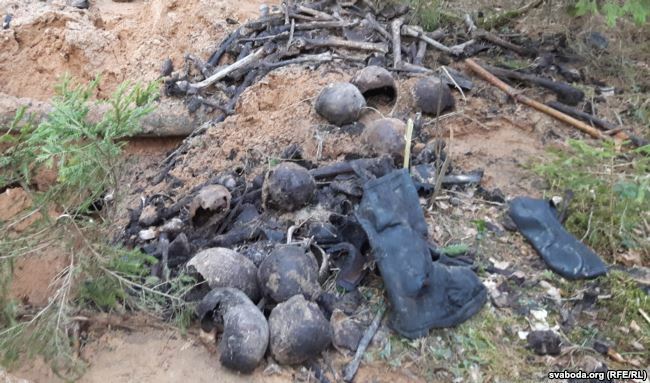 Along with the ongoing glorification of the Soviet past, this was probably one of the reasons why the authorities preferred to treat the human remains from the 2015 site as “victims of the Great Patriotic War”. The formal explanation relied on the claim that soldiers from the 52nd Search Battalion had found a piece of cloth identical to those used in German uniforms. However, archaeologists Mikalaj Kryvalcevič and Valiancina Viargej, who examined the site in 2015, noted that execution weapons were typical for the NKVD, not the Nazis. The scientists also pointed out a lot of similarities between burials in Hajsy and Kurapaty – a forest on the outskirts of Minsk, where the NKVD executed thousands of Belarusians during the Great Terror. In 2017, the experts from the Belarusian Academy of Sciences confirmed these findings. Execution style, cartridge cases, coins, footwear and personal belongings all indicate that the Hajsy burial site was a shooting ground of the Stalinist period. Despite these additional data, the authorities still refer to the need for further investigation and research to be able to grant Hajsy the status of a memorial. The extent of the Stalinist repressions cannot be evaluated without access to the KGB archives. Yet these are closed to the public and researchers. Therefore, the number of Great Terror victims can only be estimated, with suggested figures for those who suffered between 1917 and 1953 ranging from 600 thousand to 1.5 million people. Currently, only relatives of victims can request information from the KGB. Yet even they do not receive the complete cases of their repressed family members. The Belarusian KGB managed to bend the laws in its favour, restricting public access to the files on the Stalinist repressions. Due to privacy reasons, the archives generally release the documents after the term of 75 years. The KGB invented a new interpretation of this norm, counting the 75 year embargo not from the time of the file’s creation, but from the moment of person’s rehabilitation. This means that files of those rehabilitated in the 1990s would remain classified for decades to follow. Many Belarusians are still not aware that in Minsk alone there are at least seven more places where the NKVD shot innocent people. Maly Trascianec, a Nazi death camp during WW2 was among them. Soviet authorities skilfully hid these crimes, claiming that all victims died at hands of the Nazis. As the Hajsy story demonstrates, current Belarusian regime eagerly follows the Soviets’ lead. Stalinist repressions touched nearly every Belarusian family, just as the war did. Yet due to the lack of a critical evaluation of the Stalinist past, currently civil society initiatives alone remind Belarusians of its cruel realities and bring to light the NKVD’s crimes.